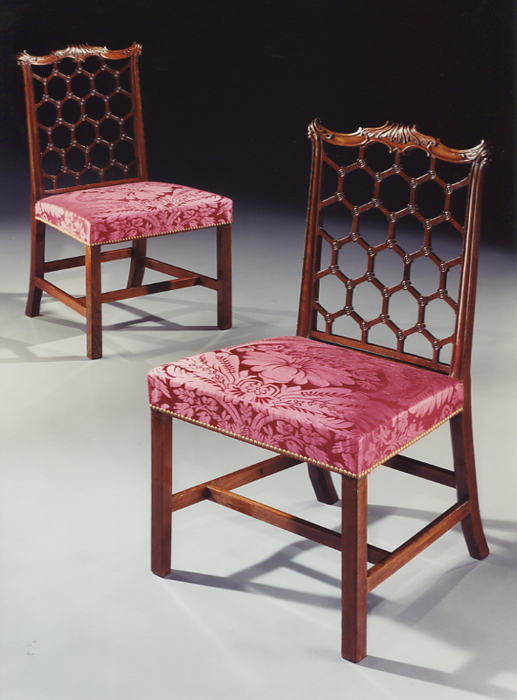 A very fine quality PAIR of antique English George III period side chairs being, executed in faded mahogany, the top rails to the backs being carved with naturalistic designs and C-scrolls, the open ‘lattice’ carved mahogany back-panels being laminated, each individual hexagonal panel with circular moulded paterae, the chairs supported on square chamfered front legs and outward-splaying rear legs, the legs joined by mahogany stretchers, the backs of the chairs designed in the manner of ROBERT MANWARING. ILLUSTRATION: Chippendale Furniture: The Work of Thomas Chippendale and his Contemporaries in the Rococo Taste; Vile, Cobb, Langlois, Channon, Hallett, Ince and Mayhew, Lock, Johnson, and others, circa 1745-65 by ANTHONY COLERIDGE, p. 188, & fig. 138. 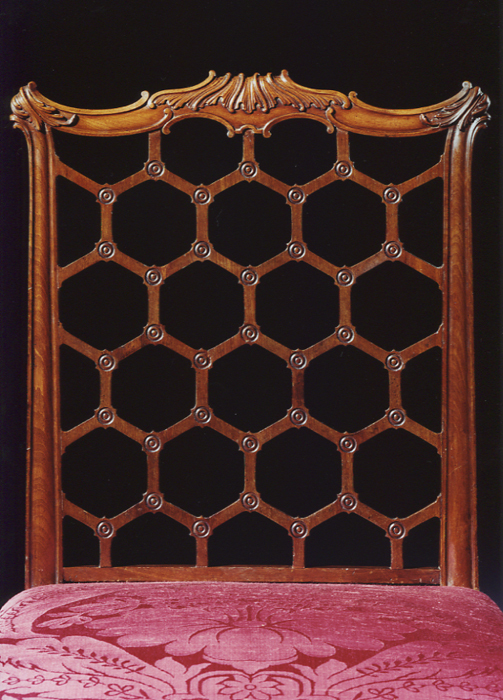 This illustration shows a virtually, identical chair, one of a set of eighteen, formerly from the Summer Dining Room at Stowe House, Buckinghamshire. The ONLY difference is that the ‘Stowe’ set does NOT have the circular moulded paterae decoration to the hexagonal back-panels, these panels on the ‘Stowe’ chairs being plain. A set of four armchairs with wooden panelled seats and identical backs are also known (see Chippendale Furniture, op. cit. p. 188; note 138). 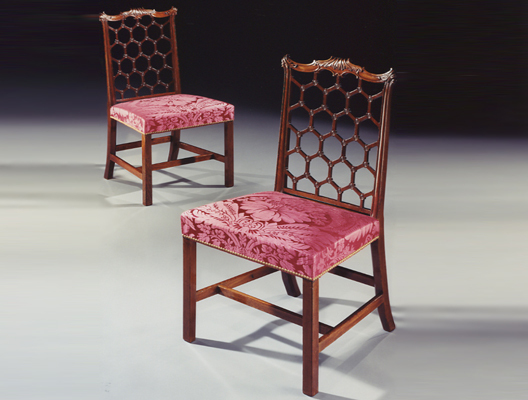 A similar armchair from a design in Manwaring’s The Chair-Maker’s Friend is in the collection at the Victoria and Albert Museum, London, and another simpler version armchair is in the collection of the Earl of Mansfield, Scone Palace, Perthshire. Width (of seats) 22in (56cm). Depth (of seats) 17in (44.5cm).